Inside every hexagram there is a cube trying to get out but, just like the thin woman hiding inside Eddie, it isn’t that easy to spot. New Scientist magazine has a regular math puzzle called Enigma. A few years ago they posed this intriguing problem. At first sight this is the worst possible kind of puzzle. You have to try lots of ways of assigning numbers until you stumble across the right answer. Very boring! The best kind of puzzle is when you spot a neat insight that makes everything easy. Guess what, that is exactly what we are going to do here! 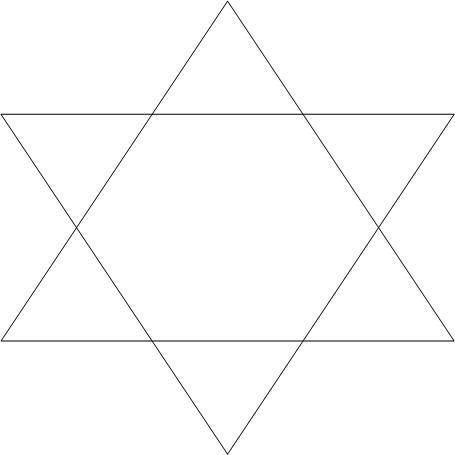 Hexagrams have 6 lines connected at 12 vertices, 6 in the middle and another 6 at the points of the star. If you look closely you will find 8 triangles, 2 big ones and 6 around the edge. Cubes have 6 faces connected at 12 edges and at 8 corners. This is a big clue to what follows. I am not asking you to solve the whole thing today. What is the sum along each line? Remember it is the same for each line. Each line has four vertices. You can also think about the similarities between hexagrams and cubes. I have already given you some rather strong hints. Can you make sense of them? Of course if you can solve the whole puzzle then that would be fantastic! I will solve it in the next post, and reveal the hidden cube!